Leizhan make progress together with the customer to optimize the runnability and production efficiency of paper plants. With Leizhan hi-tech paper equipments and specially designed solutions, our customers achieve highest production efficiency and maximum production capacity, and optimum performance paper production system. To improve the production efficiency of kraft paper system while minimizing the operating and maintenance cost，Leizhan engineer develops high performance solution for paper mill. 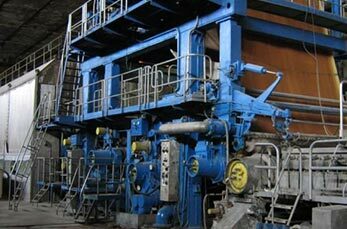 Leizhan specialists and engineers know how to improve and optimize the performance of paper equipment. Experienced engineers and specialists of Leizhan closely with our partners to improve paper machines and individual components by importing advanced technologies and keeping innovating. Leizhan services range from individual components to a whole paper production line for a process area or an entire plant. 1. Mainly used for conveying various kinds of pulp board, waste paper in bulk and in bundle which can be horizontal conveyor or inclined conveyor(<30°). 2. Adopt special made chain drive one-time impact stamping, trough plate to convey material, which has advantages of large capacity, low motor power, less wear, reliable operation and high efficiency. 3. Steel casting of sprocket can improve the wear resistance of the device. 4. Chain board adopts closed design to prevent material leaking. 5. Two rows of idler traction chain and hollow roller shaft,and oil can be injected from pin roll to shaft sleeve and wear-resistant zinc-copper bushing. 6. Two rows of chain adopt long axis to prevent chain running deviation. 7. Raw material feeding plate adopts V design( more than effective conveying width 400mm) to improve raw material throughput. Iran Print & Pack 2016, are you ready?